Yoga Sutras of Patanjali 1.1-1.4: What is Yoga? Being prepared to start: To sincerely begin the pursuit of Self-realization is a most significant step in life, when the highest goal of life is taken on as number one on your list of things to do. The first word of the Yoga Sutras is atha, which means now (1.1). This particular word for now implies a preparedness in arriving at this auspicious stage of desire and commitment towards Self-realization, the highest goal of Yoga. Yoga is the mastery of the activities of the mind-field. Then the seer rests in its true nature. Knowing what's left after setting aside the obstacles: There is a fundamental simplicity to the process of Yoga that is outlined in the Yoga Sutras. While the process might appear very complicated when reading the Yoga Sutras and many commentaries, the central theme is one of removing, transcending or setting aside the obstacles, veils or false identities. The many suggestions in the Yoga Sutras are the details or refinements of how to go about doing this. By being ever mindful of this core simplicity it is much easier to systematically progress on the path of Yoga. The true Self shines through: Once the obstacles and false identities have been temporarily set aside, the true Self, which has been there all along, naturally comes shining through (1.3). The rest of the time, we are so entangled with our false identities that we literally do not see that this misidentification has happened (1.4). It is the reason that sometimes it is said that we are asleep, and that we need to awaken. That awakening to the Self is the meaning of Yoga. Like a mirror: Consciousness looks outward, through the intellect, through the mind, and then through the senses and body. It sees a reflection, like a mirror. It sees reality, a world, a self-identity, which it falsely thinks to be "me" or "mine." Through the forgetting power of avidya or ignorance (2.5), pure consciousness says, "I am this or that!" This is not all bad, for it gives the opportunity for the joy of awakening, through a journey called Yoga, returning to the wholeness that was never really divided in the first place. Yoga is samadhi: Both ancient and modern sages, including Vyasa, the most noteworthy commentator on the Yoga Sutra, flatly declare that Yoga is samadhi, the high state of perfected concentration or complete absorption of attention (3.3). Yoga means union, literally, to yoke, from the root yuj, which means to join or to integrate. It means to bring together the aspects of ourselves that were never divided in the first place. It means to attain direct experience of the core of that preexisting holistic being who we truly are at the deepest level, and that is attained through samadhi. Yoga is not: Yoga is not merely physical fitness, stress management, medical treatment, or a means of manifesting money, although authentic Yoga is definitely beneficial to many aspects of life. The goal of Yoga is Yoga, period. Introduction article: It is useful to read the Introduction to the Yoga Sutras page, which describes several approaches to exploring the Yoga Sutras pages of this website. Yoga comes after preparation: This introductory sutra suggests that after our many actions in life, and whatever preparatory practices we might have performed, now, we are finally ready to pursue the depths of self-exploration, the journey directly to the center of consciousness, Atman, or Self, our eternal and True identity. Discipline and learning: To practice Yoga requires cultivating discipline and following a systematic method of learning (anushasanam). This has more to do with the quality or conviction in one's practices than it has to do with the quantity. This is described in greater detail in sutras 1.21 and 1.22. Know where you are: It is very useful to be aware of these stages, both in the moment, and as a general day-to-day level at which one is functioning. It reveals the depth of practice that one might be able to currently practice. Some aspect of yoga meditation applies to every human being, though we need to be mindful of which is most fitting and effective for a person with this or that state of mind. Two of the states are desirable: Of the five states of mind (described below in more detail), the later two (one-pointed and mastered) are most desirable for the deeper practice of yoga meditation. For most people, our minds are usually in one of the first three states (disturbed, dull, or distracted). To deal with the troubled mind and the lethargic mind is progress, leading one to a merely distracted mind, from where one can more easily work on training the mind in one-pointedness. The Mudha mind is barely beyond the Kshipta, disturbed mind, only in that the active disturbance has settled down, and the mind might be somewhat more easily trained from this place. Gradually the mind can be taught to be a little bit steady in a positive way, only occasionally distracted, which is the Vikshipta state. Then the mind can move on in training to the Ekagra and Nirodhah states. The Vikshipta mind in daily life can concentrate on this or that project, though it might wander here and there, or be pulled off course by some other person or outside influence, or by a rising memory. This Vikshipta mind is the stance one wants to attain through the foundation yoga practices, so that one can then pursue the one-pointedness of Ekagra, and the mastery that comes with the state of Nirodhah. 5. Nirodhah/mastered: The Nirodhah mind is highly mastered, controlled, regulated, restrained (Yoga Sutra 1.2). It is very difficult for one to capture the meaning of the Nirodhah state of mind by reading written descriptions. The real understanding of this state of mind comes only through practices of meditation and contemplation. When the word Nirodhah is translated as controlled, regulated, or restrained, it can easily be misunderstood to mean suppression of thoughts and emotions. To suppress thoughts and emotions is not healthy and this is not what is meant here. Rather, it has to do with that natural process when the mind is one-pointed and becomes progressively more still as meditation deepens. It is not that the thought patterns are not there, or are suppressed, but that attention moves inward, or beyond the stream of inner impressions. In that deep stillness, there is a mastery over the process of mind. It is that mastery that is meant by Nirodhah. In the second sutra of the Yoga Sutras (the sutra below), Yoga is defined as "Yogash Chitta Vritti Nirodhah," which is roughly translated as "Yoga is the control [nirodhah] of the thought patterns of the mind field." Thus, this Nirodhah state of mind is the goal and definition of Yoga. It is the doorway by which we go beyond the mind. Nirodhah suggests self-training: This single sentence is a most succinct definition of the science of Self-realization, or Yoga. The key to understanding is the word nirodhah, which defies translation or description. When translated poorly or misunderstood, it can sound like the suppression or repression of thoughts and emotions, which is definitely not what Yoga is about. Rather, it has to do with a process more like coordinating and setting aside what is not significant or not-self (2.5). It means finding the jewel of Truth that is underneath or behind all of the other activities in the mind-field. This comes through a self-training program dealing with the relationships, senses, body, breath, and mind. Ultimately, the meaning of nirodhah, and thus, of Yoga itself begins to emerge experientially through doing the practices. Nirodhah is the most desired of five states of mind: The sage Vyasa names five states of mind, of which the nirodhah state of mind is the desired state of mind for the realization of the true Self. These five states of mind are described just above in the discussion of Sutra 1.1. It is extremely useful to be mindful of the five states of mind, so as to better understand their relationship to this most desired state of mind. Uncoloring your thoughts: To find the jewel of the Self requires getting past the coloring of thought patterns (1.5), such as attachment, aversion, and fear (2.3). This involves witnessing your own inner process. Then the Self stands alone: As a result of having done the process of nirodhah, described in the last sutra, the true Self stands alone, unencumbered by our many false identities (described in the next sutra). This standing alone process is why the phrase Self-realization uses the word realization, rather than a word like attainment. The process is not one of attaining something we do not have, but rather is one of removing the clouds, so as to see the light that is already there. Awareness remains unchanged: In deep meditation, you come to see that while the thought patterns shift here and there, ever changing their shape, the way that the waves on the ocean keep shifting, the awareness itself never changes. There is a constant, ever flowing, ever being awareness that simply is, that observes or witnesses. In meditation, this same truth is realized over and over, as layer after layer, level after level of mental process is revealed and seen to be like the deeper shifting of the ocean waves. The awareness itself remains unchanged, and will become clearer and clearer as the center of consciousness that stands alone, though part of all the levels it permeates. The seer: The word drastuh means seer or witness. The word seer does not give you a theological or metaphysical description or definition of who you are. This is one of the beautiful qualities of Yoga and the Yoga Sutras. There is nothing in the word seer to believe or not believe. By saying that the seer rests in its true nature after transcending the many forms of thought patterns in the mind field (1.3), one can simply do the purifying practices and personally experience the results. In English translations, the word drashtuh is often given meanings such as Self, Soul, or Atman (such as in the translations above). This provides some clarity or speculation of the nature of this seer, but it is useful to remember that Patanjali is not actually telling you what is the nature of your true self, but that the seer will be experienced in itself, in its true nature, whatever or however that is ultimately experienced and described by each person. Experiencing the seer in its own nature: Similarly, the word svarupe means in its own nature. Here also, Patanjali is not giving a definition of your true nature. Once again, there is nothing to believe or not believe. Through practice and non-attachment (1.12-1.16) and transcending the many mistaken identities (1.4, 2.5), you come to the direct experience of your own nature. Yet, most of us are curious and want to hear or read about the descriptions of this true nature, leading us to speak of, and to describe Self, Soul, or Atman, etc.. While we use, describe, and discuss these terms it is, again, most useful to keep in mind that Yoga actually refers to it simply as the seer, which is resting in its true nature, allowing direct experience to reveal what this is. When we are not aware of our true nature: When activity of all levels of mind have been transcended (1.2), we experience pure consciousness (1.3). However, the rest of the time, mind flows towards the many sensory experiences we have, as well as towards the streams of memories and fantasies. The existence of the external world and the memories is not the problem. Rather, the pure consciousness mistakenly takes on the identity of those thought patterns. In this way, we incorrectly come to think that who we are is one and the same with these thoughts. The solution is to separate the seer and the seen (2.17), the experiencer and the object experienced, and this is the theme and practice of Yoga. Consciousness wraps around mental objects: When a metal sculptor wants to make a mold, he might first make a plaster statue, then form the clay mold around that statue. Later, that clay becomes the mold for pouring the liquid metal. The process of the clay taking the form of the original plaster model is the meaning of the seer or Self appearing to take on the form of the thought pattern stored in the mind-field. When pure consciousness wraps itself around the mental object it encounters, it only appears to take on the identity of that object. It is a sort of mistaken identity that results. Gold and clay: Gold is melted, reformed, and fashioned into many different ornaments. Yet, it remains gold. Clay is pushed and pulled and twisted, and shaped into many different bowls or other objects. Yet, it remains clay. However much consciousness shapes itself into the many objects stored in the mind field, that consciousness remains pure, standing alone. That consciousness, itself lacking any form, is described as having the nature of existence, consciousness, and bliss. It is always a mental object: The object around which consciousness wraps itself is always an inner, mental object, even though there may be an external object being perceived through the senses (indriyas). If you see and smell your favorite food (or most offensive object), it is the memory of that experience, the mental object that is being triggered and brought to the surface. Even if you have never experienced this particular object before, it is presented through the eyes and nose (and other senses) to the mind field, as if on a movie screen, which the seer can then watch. The experience itself is between the inner witness and the presented object, and that presented object might come either through the senses or memory (or subtle realm, internal awareness). The significance of this is that we need to work with our inner awareness in relation to mental objects. In other words, we need to train our own mind and senses. 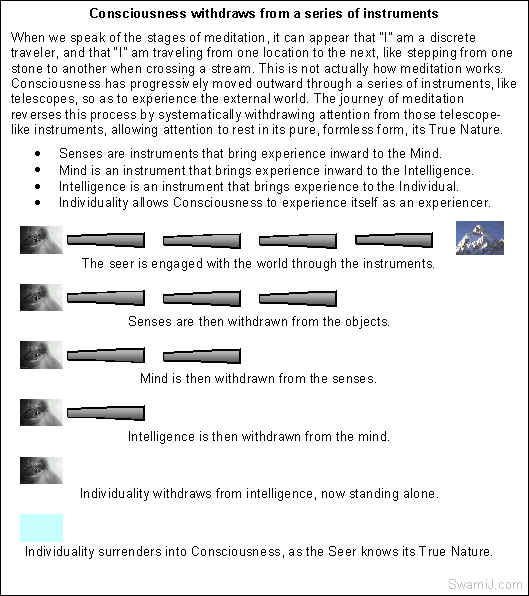 Five forms of mental objects: The five types of thought patterns that result from this false identity (of the Seer taking on false identities) are described in sutras 1.5-1.11. How to release consciousness from these few categories of mistaken identity is the process of enlightenment, and is the subject of the Yoga Sutras.